Nonlocality implies that a fist in Des Moines can break a nose in Dallas without affecting any other physical thing (not a molecule of air, not an electron in a wire, not a twinkle of light) anywhere in the heartland. Einstein’s term, spukhafte Fernwirkung, or spooky action at a distance, is dismissive. A more polite term is entanglement. 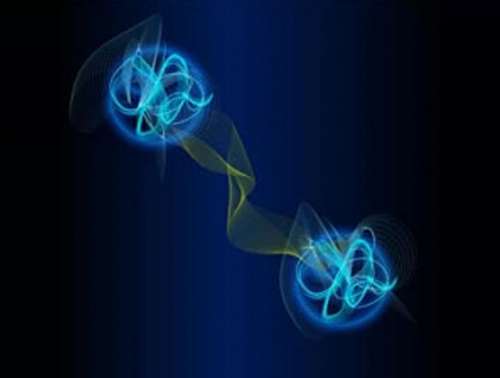 Aczel calls it ‘the greatest mystery in physics.’ Take two somethings like two electrons or two photons. Make them interact. A simple way is make them as a pair in one event. QM tells us they are now entangled. Let them wander off. They stay entangled. ‘Entangled’ means their properties are ‘linked’. The reason is that they comprise a single quantum state. For example if it’s made of two electrons their spins must be opposite. Thus, no matter where they are, one measures one and knows the answer for the other. But QM says an electron doesn’t have a spin that’s up or down until its spin is measured. It’s the measurement that makes it pick which spin to have. So measure one and find it’s up―instantly the other is now down no matter where it is. That’s what makes it spooky: It’s the distance. Experiments confirm that this is so. Furthermore, if two objects―call them A and B―become entangled and two others C and D become entangled with each other too, if one entangles A and C then this entangles B and D though they were never near each other. One can’t use the entanglement to send a message. So the speed of light still limits messages as well as mass. But it seems clear entanglement has action one place causing instant change some other place. The Spooky Action Problem is QM says nothing about how it works.